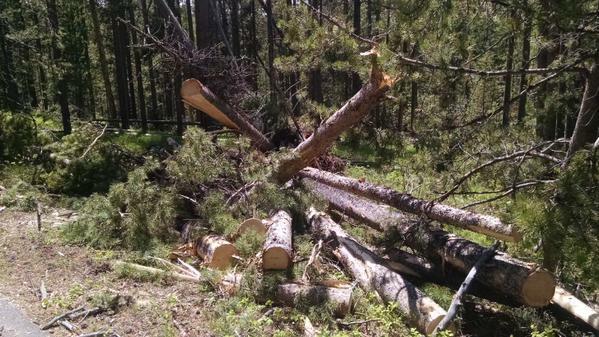 By: Yellowstone Gate | June 2, 2015 View as "Clean Read"
Strong winds in Grand Teton National Park toppled more than 150 trees Monday evening, leaving crews scrambling to clear roads and restore electrical power. A strong early season storm left crews in Grand Teton National Park scrambling Monday to restore electrical power and clear roads of more than 150 trees toppled by powerful winds. The blustery weather ripped through the park around 6 p.m. Monday, temporarily stranding visitors on parts of the Teton Park Road, Moose-Wilson Road and Signal Mountain Summit Road, as well as blocking traffic in many other areas. Park rangers, road crews, and fire engines responded to clear park roads of over 150 downed trees, with no visitor injuries reported and most auto traffic returning to normal by 11 p.m., according to a statement released by the park’s public affairs office. High winds were observed throughout the park, with wind speeds of 52 mph recorded at the Jackson Hole Airport at 5:56 p.m. Teton Interagency Dispatch Center received reports of many downed trees and power lines blocking park roads, and disrupting access and service to campgrounds and other park areas shortly thereafter. Affected areas included: Teton Park Road at Cottonwood Creek, Catholic Bay on Jackson Lake, and Mount Moran Turnout; Moose-Wilson Road; Signal Mountain Summit Road; North Park Road near the Moran Entrance Station; Colter Bay Visitor Center and campground; Pilgrim Creek Road; Cattleman’s Bridge Road; Deadman’s Bar Road; and other areas in the park. Park rangers kept watch through the night at downed power lines on the Teton Park and Pilgrim Creek roads. Lower Valley Energy crews were able to remove downed lines from the Teton Park Road by 6 a.m. Tuesday, and the road was re-opened to travelers. Only minor property damage to vehicles and structures was reported. While most park areas and services are open at this time, many areas are operating on backup power generators. Park maintenance crews and Lower Valley Energy are continuing to restore full functionality to utility systems, water systems, wastewater treatment facilities, and other park infrastructure. Full repairs expected to take a few days. Visitors to Grand Teton are reminded that severe weather can strike at any time during the summer months. Park officials caution that visitors should be prepared to spend extended periods of time in your vehicle or campsite whenever severe thunderstorms occur. Downed power lines should always be treated as live and should never be approached. Grand Teton National Park's Teton Park Road between the Taggart Lake Trailhead and Signal Mountain Lodge has been cleared of snow and is now open to non-motorized recreational uses such as walking, bicycling, and rollerblading. Recreationists should be alert for park vehicles that periodically travel this roadway for administrative purposes as spring opening operations continue. 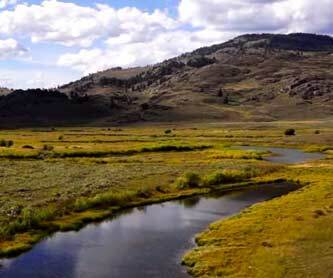 Filmmaker Charley Voorhis spent three days in Yellowstone National Park and five days in Grand Teton National Park capturing images of wildlife, scenery and weather to create "Primordial," a captivating 7-minute video that offers an intimate and gorgeous portrait of the parks. While in Yellowstone, Voorhis, spent most of his time "trying to dry off after countless storms would roll in and swallow the caldera, then roll out and give me sunshine with dark clouds looming on the horizon," he writes on his blog.